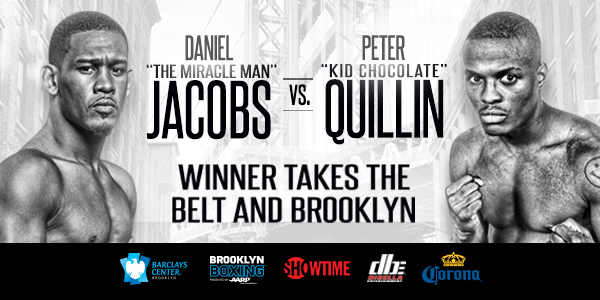 New York City (December 3, 2015) – In a highly anticipated showdown between Brooklyn’s most exciting and talented fighters, WBA Middleweight World Champion Daniel “The Miracle Man” Jacobs (30-1, 27 KOs) will take on former world champion Peter “Kid Chocolate” Quillin (32-0-1, 23 KOs) on Saturday, December 5th from the Barclays Center in Brooklyn, New York live on Showtime (9 PM EST). This fight, now known as the “Battle for Brooklyn” will feature many great under-card fights, as well as an action packed main event. Today, at the BB King Bar and Grill, the final press conference before Saturday’s showdown took place and as usual, Team Everlast was there to cover it. As media packed the downstairs lounge, the fighters took their places on the main stage as DiBella Entertainment President Lou DiBella took the podium to welcome everyone, and to introduce the first speaker of the afternoon, CEO of the Barclays Center, Brett Yormark. “Saturday night will be a special moment for me, the Barclays Center, and most importantly, Brooklyn” Yormark stated. Yormark went on to discuss his personal relationship with both fighters and spoke about how this is going to be an exciting weekend for the city, and the venue. Showtime Sports Executive Stephen Espinoza then followed Brett Yormark to make his statement as this mega-fight will be airing live on Showtime, starting at 9 PM EST. After talking up both fighters, Espinoza was quoted saying “I don’t do this often, but I’ll guarantee that we have exciting fight after exciting fight” when speaking to the entire under-card and main event. “It’s rivalry week in NYC and right in the mix is the Battle for Brooklyn,” Espinoza said. After a brief statement, he remembered to remind us all that tickets are still on sale and you shouldn’t miss out! One of the first exciting under-card match-ups feature Light Heavyweight fighter Will Rosinsky who will be taking on Joe Smith Jr. Rosinsky was quoted saying “me and Joe go back a long way, there’s going to be fireworks from start to finish” before guaranteeing a win in front of the fans from Brooklyn. Smith Jr, who was not in attendance, didn’t have the opportunity to respond to a guarantee win that Rosinsky promised like most fighters would love to do. Following Rosinsky is another Light Heavyweight match-up that features an exciting and undefeated boxer in Marcus Browne. Browne will be taking on a tough opponent in Francisco Sierra in a 10 round bout. Browne wanted to make sure he thanked his fans and supporters when stepping to the podium. “I want to thank Al Haymon and I’m here to showcase my talent” Browne stated before talking up the other fighters and match-ups. Next to the podium is, in Lou DiBella’s terms, “ladies man” Chris Algieri. Algieri started off by saying “this is my first time on Showtime Sports, so I’m looking forward to that” before thanking everyone for the opportunity. “It’s really an honor to fight on a card with so many great fights with so many great fighters” Algieri said. Algieri will be taking on a tough opponent in Erick Bone who was also extremely thankful for the opportunity to be on this great under-card. Lou DiBella came back to the podium to not only introduce the main event, but to hype it even more as well. DiBella stated this fight is truly hard to judge and even tried to make his own prediction by saying “who do I like? I like both them, and that’s the truth.” “This is a scary fight for both guys, but both are extremely confident” DiBella stated about the magnitude of this fight for both fighters. “Two young men, a champion, a former champion; as a fan I’m really excited to watch this fight” DiBella said before introducing the former champion, Peter Quillin. Quillin came up to the podium by first praying for Prichard Colon and the horrible tragedy that took place in his last fight that put the young boxing star in a coma. Quillin then spoke about how after being down in Miami for camp he realized what it means to have an impact on someone’s life. “It’s about how much you impact a person, I want to plant seeds into people’s hearts and I fight for the people that need strength.” Quillin then went on to say “thank you Showtime, Stephen Espinoza, I’m glad to be on Showtime and I also want to thank my all access crew who was down there with me.” “I got so many things to be blessed about and so many things to be happy about” Quillin said about his life over these last few years. “Lou DiBella, we have been ‘frien-a-foes’, I’m happy to be apart of your card” Quillin said to a smiling DiBella. “Brett Yormark, big inspiration to me, giving guys like me an opportunity to prove myself” Quillin said. 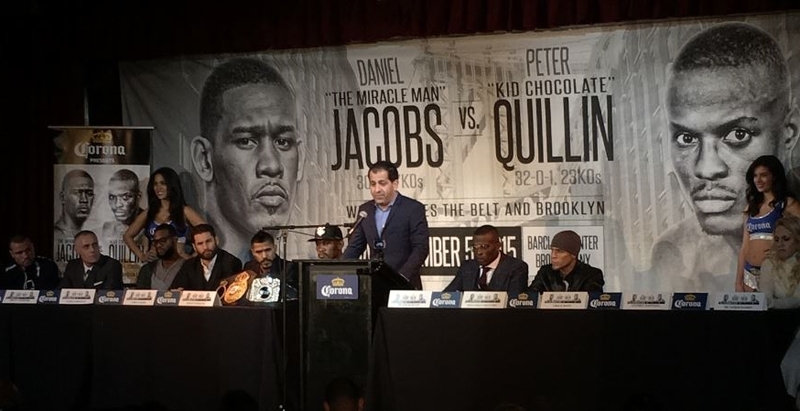 Finally, Quillin got the opportunity to speak to challenger Daniel Jacobs. “Danny Jacobs, I want to thank you, you know why? ‘Cause you’re the champion calling out an undefeated fighter, I’m thankful for you.” Quillin went on to thank Al Haymon for providing guidance in his life and giving him the right direction he needed even while others would disapprove of them. At the end of his press conference, he wanted to thank the media, and then hand it over to challenger, Daniel Jacobs. After Jacobs spoke, this concluded the press conference. This entire event is designed to give the fans of Brooklyn excitement and a great night of boxing. If you haven’t already, make sure you go out and buy tickets to the event through this link and use the promo code EVERLAST for 20% off! Hope to see everyone there!